the Plaza de las Tres cultures, where an Aztec temple, a church from the sixteen hundreds and a modern palace are located. Those who would like to visit the religious marvels should go to the northern part of the city where the frequented Basilica de la Nuestra Señora de Guadalupe is located. After a stop at the most famous museum of the city: The rich Museo Nacional de Antropologia at the Bosque de Chatulpetec, you should not miss a visit to two important archaeological Aztec sites near the city: Xochimilco, that features a unique floating garden and Teotihuacan, a complex of temples and avenues that the Aztecs thought of as the birthplace of the sun and the moon. It is the capital of the region that has the same name. Its beauty and historic value have made the city meritorious of the status of Historic Patrimony of Mankind by the UNESCO. The city is known for its religious buildings of several periods among which we would like to point out the Catedral and the Iglesia de Santo Domingo de Guzman, in Mexican baroque style. Those who care for interesting and unique souvenirs should stop at the main square: "Zocalo" and take a look at the many artisan street shops. Near the city we would like to point out two interesting places: Monte Alban , also declared as a patrimony of mankind, where tombs and Pyramids of the Zapothec and Mixthec cultures could be appreciated, and the Tree of Tule that, with a circumference of 58 metres and a height of 42 meters, is the largest tree in the world. Merida and Cancun are both located in the eastern coast of the Yucatan Peninsula . Merida , the " White City ," fascinates its visitors with its beautiful churches, lively squares and old colonial homes. At the main square we highlight the city hall, a beautiful church and the colonial Casa de Montejo. The lively Cancun is, on the other hand, the perfect destination for the tourist that seeks beautiful beaches and entertainment. The city welcomes its visitors on a great tourist infrastructure and a great nightlife. Cancun is located on a land strip that divides the Caribbean Sea from the coast and offers relaxing beaches and thrilling excursions to the nearby islands: The Isla Mujeres and the Isla Contoy. Historic Patrimony of Mankind, the beautiful Morella was built in the fifteen hundreds and it is located in the state of Michoacan. The city is a great representation of the Hispanic colonial time, and at the centre there are fascinating baroque structures built with red stones. 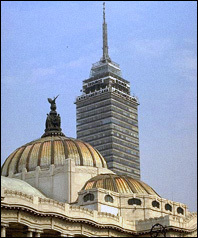 Guadalajara is, on the other hand, the capital of the state Jalisco and it is worldwide known as the "most Mexican city of Mexico ". Indeed, the typical Mexican hat and the Mariachi music come from this city. At the second largest city in the country we recommend to visit the works of art in neoclassical style El Hospicio Cabanas, built as a community centre, where Murals by Jose Clemente Orozco can be appreciated. These are two of the cities that make up the "Via de la Plata": the long road that hosted the production and commerce of silver. The stops along this road were in fact the worthy sources of Silver. Taxco is the real capital of silver and the centre that offers the best artisan work. The city rises on top of a hill inside the state of Guerrero. To visit: the baroque churches of the centre of the city, particularly the Catedral de Santa Prisca. Cuernavaca is the capital of the state Morelos and it is known for its great weather that has made it a great vacation destination for centuries. Make sure not to miss the residence of El Conquistador Hernan Cortes, the residence of the emperor Maximilian of Augsburg, and the murals of Diego Rivera.